They must be somewhat effective – why else would we keep seeing them? – yet we have to wonder how much more successful they’d be with some different messaging. Rym Benchaar wonders the same thing. She’s the founder of GrowthSpace Digital, which specializes in helping clients generate qualified and consistent leads. We’ve invited her to speak to DIG members at an all-day workshop on Saturday, April 6. Rym has helped dozens of real estate investors by helping them generate new leads through innovative yet cost-effective digital marketing practices. When it comes to investing in real estate, “I think a lot of traditional marketing still applies,” Rym said in a recent phone interview. Part of that involves coming up with communication strategies that can grab a potential seller’s interest. “When we develop any copy talking to our ideal audience, we need to put ourselves in their shoes and understand their pain,” Rym says. That lets investors put together a well-crafted message that tells sellers they understand their pain and can solve their problems. Something a bit more personalized might do the trick, she says. Rym says she recognizes that communicating in a digital space, particularly in busy social media platforms, might seem daunting. If nothing else, Rym says she hopes the investors who attend her workshop will come away comfortable with the idea of advertising online. The workshop is scheduled to run from 8:30 a.m. to 4 p.m. at the DoubleTree Philadelphia-Valley Forge on DeKalb Pike in King of Prussia. Register before March 29 to get a discount on registration. DIG will provide lunch. You can click here to fill out your registration. We hope to see you April 6. 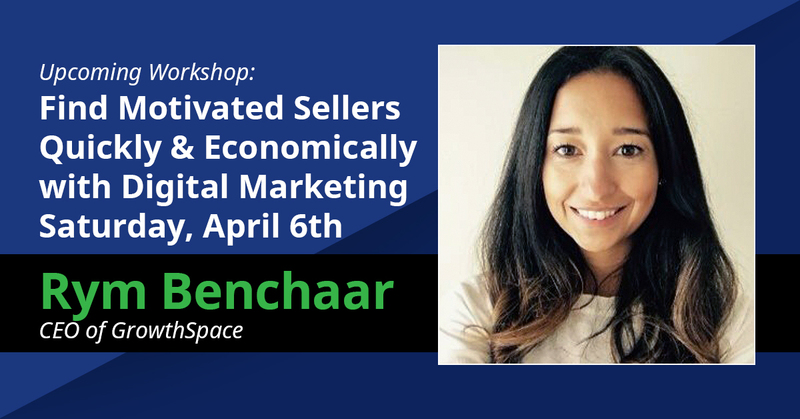 Rym Benchaar will also be speaking at our DIG General Membership Meeting on Thursday, March 28th. Click here to find out more about the General Membership Meeting.